It is with great pleasure that the 2018 Board of Directors invites you to the 92nd Annual Hopkins County Chamber of Commerce Banquet on Thursday, February 15, at 6:30 p.m. at the Hopkins County Civic Center. Please take this opportunity to bring your family, friends, and employees to an evening of dinner and community awards including Large and Small Business of the Year, Educator of the Year, Caregiver Award, Agriculturist of the Year, Woman of the Year, and Citizen of the Year. Click here for details on nomination submissions. Our banquet theme is “Extra! Extra! Read all about it!”, and is set in the roaring 1920’s. This is your chance to see what Hopkins County was like in the 1920’s era. Period dress is welcomed, but not required. Individual tickets are $30, and tables of ten are available for $500, which includes preferential seating and visible labeling of your business. We are excited for you and your business to join us for this extraordinary evening. Please make your reservation TODAY by calling Vickie, Cathey, or Lezley at the Chamber of Commerce, (903) 885-6515, or by stopping by to visit at 300 Connally Street in Sulphur Springs. 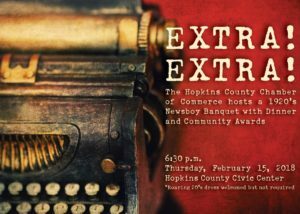 Each year, the Hopkins County Chamber of Commerce hosts an annual membership banquet in February. This is a fun evening for the membership to gather to recognize deserving individuals, groups and businesses with awards, such as Small Business of the Year, Large Business of the Year, Community Pride Award, Citizen of the Year, Woman of the Year, Vision Award, Caregiver of the Year, Educator of the Year, Growth & Renewal Award and Agriculturist of the Year. The Chairman of the Board has the honor of selecting the theme for the year's banquet. Over the past several years, we have hosted a Mardi Gras, Super Bowl, Circus and Luau! Event-goers are given the opportunity to dress the part of the theme, just to make it more enjoyable. Can’t wait to see you there! Attire: Roaring 20's dress welcomed, but not required! Register now by calling (903) 885-6515.